Go from fuzzy and confused to clear and concise. Brand messaging architecture provides clarity. Explain who you are, what your brand stands for and what your target audiences can count on. Get response. Is it hard to explain who you are and what you do? Or tough to describe why someone should choose you instead of a competitor? If a potential customer asks, "what's in it for me?" could you answer easily? Does your website's home page quickly confirm who you are, what you offer and why to choose you? Do people "get" what you're about, what they can expect? Even when the visual brand (logo and graphic elements) is recognized quickly, the verbal brand can be confused, inconsistent or missing. Or you or your team default to listing a bunch of products and services and not the important elements that lift you above the crowd. With strong brand messaging, the verbal brand will inspire response after an introduction. It will appeal to your audiences, from their point of view, and it will clearly express what you deliver. Stronger than a tagline, a brand promise is focused on your promise to your audiences. What can people count on from you? Messaging architecture adds context to the brand promise. It defines what you're known for, what audiences recognize as your "wow!" It's the foundation for marketing and guides how you want to be perceived and remembered. This chart is the reference for all written and online communications. Once established, messaging guides the verbal brand. It helps everyone to speak clearly about the benefits you offer, instead of list products or services. Job Growers, Inc. based their new brand identity on the name and messaging hierarchy. Their board members quickly communicated their purpose and scope of services. 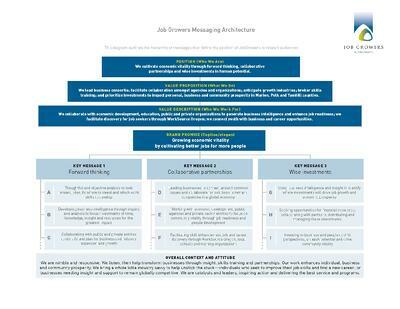 Messaging architecture blends positioning—defining a niche and purpose—around specific audience benefits. It can be versioned for different target audiences. Messaging becomes the structure to organize website information and communicate critical ideas in all communications. Messaging architecture can be developed on its own, as part of a rebrand, or as the foundation for a new name and new brand. As an integral element of the branding process, messaging articulates the positioning of the organization. It's a keystone to a successful rebrand. Message strategy or messaging hierarchy? Download our messaging guide below to see examples and learn more. Or drop us an email to schedule an initial discussion of your objectives. There's no charge to learn more about creating your verbal brand. Wow, do you guys and Creative Company have the message and content just right. This is one of the best newer websites I have come across in a while as Mayor. And personally I am very thankful that we have both of you on our side. Five years after starting my consulting business, I knew that my messaging needed focus and clarity and that's exactly what Creative Company delivered! I was most impressed with their ability to elicit my thoughts and ideas and guide me through a process of continued refinement. The resulting messaging hierarchy developed for my business is fantastic and makes it easy for me effectively communicate with prospective clients in a clear and compelling way.